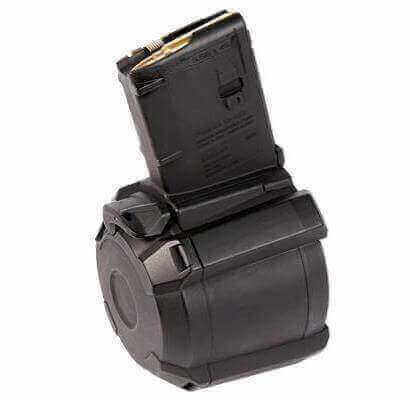 Up your capacity with the best AR-15 drum magazine on the market. Compatible with a wide range of NATO firearms such as the AR-15, M4, M16, SCAR™ MK16/16S, HK®416, MR556, M27 IAR, IWI Tavor, and others. *Optimized for use only with 5.56×45 NATO/.223 Remington cartridges. Use with other calibers such as .300 AAC Blackout is not recommended. **The D-60 is designed to lock the bolt back after the last round for most AR15/M4/HK416 platforms. Inserting an empty magazine and manually cycling the charging handle will not activate the bolt hold open feature. In addition this feature may or may not work for weapons with bolt hold open levers that don’t adhere to the Colt-spec. Great purchase! Really fast shipping!! Satisfied customer here!